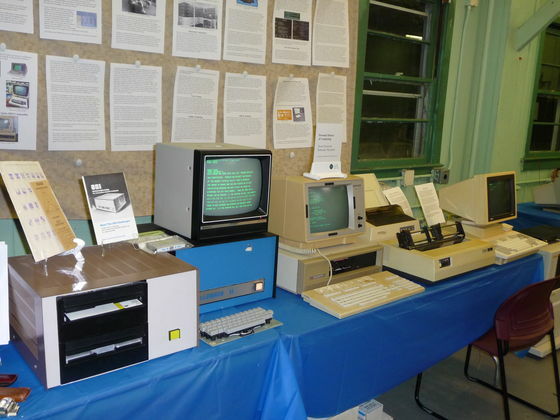 On the left is an Ohio Scientific Inc. (OSI) computer similar to one of the two my high school had. It has two 8 inch floppies for storage, 48 kbytes of memory and 64x32 character graphics. It's running the Mugger game my brother wrote. I also had available a space two player shoot at each other game, poker, and blackjack that I wrote. I also showed the modifications to the operating system I did. What came with the machine was quite primitive. The OSI has various symbols such as ships in its character set for games. Mugger is probably the best of the games we did. The TI just needed some bad memory chips replaced and the AC line (X/Y) capacitors in the power supply replaced. The clock battery was also dead but had not leaked.